Garden Makeover Shows – Love ’em or Hate ’em? Personally as a landscaper I hate these garden makeover shows – they get right on my nerves as they promise the garden of your dreams for a minuscule price. Last week I watched a garden makeover show (that shall remain nameless) where the homeowners wanted a garden with a theme of Africa for the grand budget of £6,000 – I laughed and thought no way. So it starts with the design – god awful designs presented to clearly un-knowing homeowners who have no clue what is a good design, what is a realistic budget and clearly what is good landscaping. They were over the moon and chose their favourite design, this then progressed to the build…cue shockingly bad landscaping! Now the soft landscaping may have been acceptable (I’m no expert) but the hard landscaping well let’s just say it left a lot to be desired. The blockwork walls they put up were rendered… badly and the table they built wobbled– it was overall pretty shocking. But why do I get so annoyed by programmes like this….well it gives homeowners who know little about landscaping unrealistic expectations of cost, it also leads them to believe that the presenters on the telly are ‘experts’ in their field – I’m not sure I concur with this. Yet this doesn’t just happen on garden makeover shows but I have seen it on various shows that focus on buying and selling houses where the presenters (who are not tradesmen) say things such as, ‘this driveway should only be £50 per m2’ or the best I heard was for a property that had no rear access but to completely re-turf the garden (no mention of prepping the base/digging out/ getting rid of waste etc), ‘should only be max £1,000’ this was based on the price of turf then multiplied by the area! Where do they get these so called experts from!!! So, my rant is officially over BUT the morale of the story is to ignore these garden makeover shows and these ‘experts’ and do your own research on what you want from your garden or driveway before making a budget as it could be unrealistic and achievable. Landscaping, done properly that will last many years, is expensive! A design led installation will be more expensive as it will no doubt be a more complicated design and therefore more labour intensive. 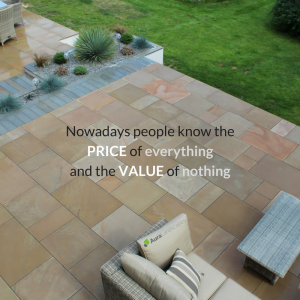 Great products are expensive, the ground preparation is expensive…it is not cheap to have a fantastic garden or a driveway that draws attention from everyone who passes. FACT. If you want cheap be expected to have a installation that won’t stand the test of time as corners will be cut to ensure there is profit in the job i.e. not a suitable dig out or sub base, poor quality materials, no attention to detail, waste fly tipped – I think you get the picture.